Eero Saarinen is well-known for “talking with a pencil,” evident in impromptu drawings and expressive sketches produced on the closest material at hand. Seminal drawings for his mature architectural projects survive on the backs of menus, as insertions into letters he wrote to friends and relatives, and in the margins of his desk calendar. The earliest known document of Eero’s creative process as a designer is this series of pencil sketches he clustered on the end and back pages of this book, Henry of Navarre by Henry Dwight Sedgwick, published in 1930. It is not hard to imagine the precocious twenty-year-old designer randomly pulling this novel off his shelf to quickly record these studies for the furniture that his father, Eliel Saarinen, asked him to design for Kingswood School Cranbrook, the school for girls completed in 1931. 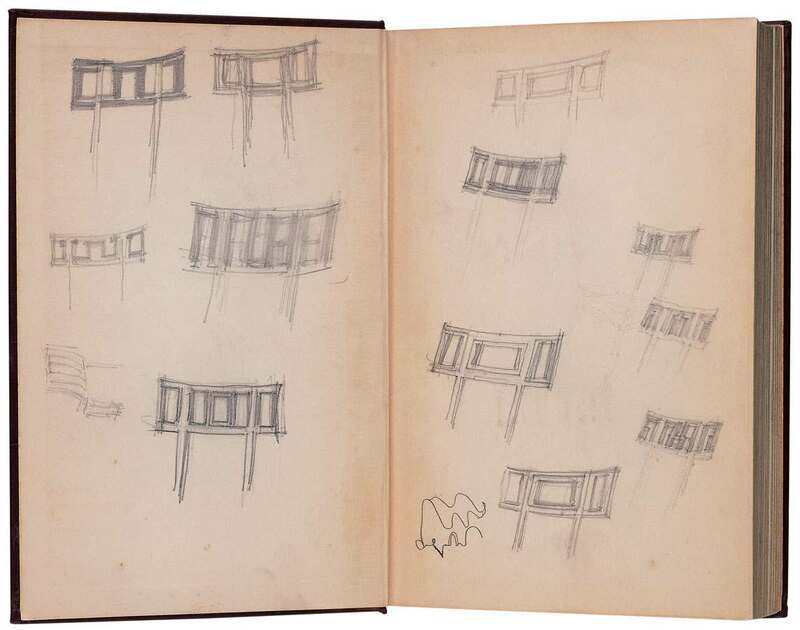 The studies on the two pages illustrated here capture his initial ideas for the Dining Hall Side Chair, an Art Deco design that undoubtedly drew inspiration from the nineteenth-century Scandinavian furniture he remembered from his childhood and recent summers spent in Finland.